I am out of bed at an ungodly hour in the morning, shuffling down the road with my hands stuffed in my sweatshirt pockets. 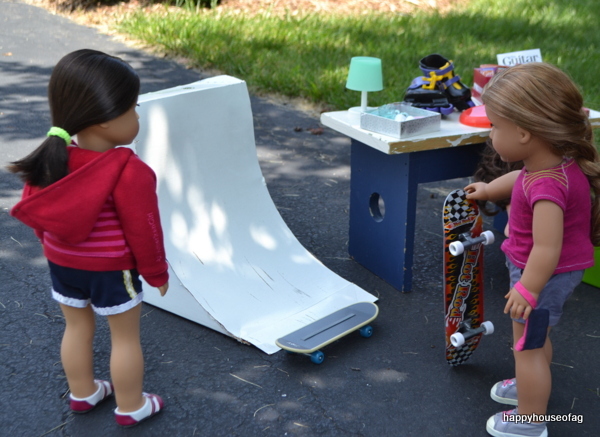 Eve’s friend at the skate shop texted her earlier about a skate ramp at a yard sale, and she convinced me to go looking for it with her. Caroline sent Nevaeh with us because she doesn’t trust us together. Jogging after Eve on her skateboard, we cruise down the street past flourishing flower beds and kids playing basketball in their driveways. The chill of the 8 a.m. air makes my legs prickle. “Almost there,” Eve tells us, swerving lazily around rocks. “This is the one?” I ask as we slow down in front of a sign advertising clothes, dishes, sports gear, etc. Eve glances down at her phone, checking the address. “Yep.” She jams it into her back pocket and glides into the driveway. Nevaeh and I trail after her. 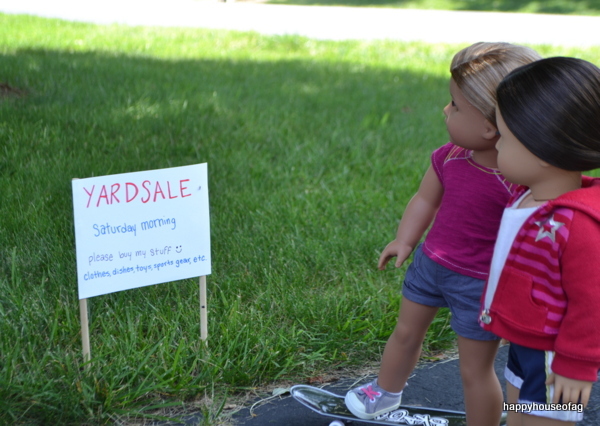 I haven’t been to many yard sales in my life, so I’m not exactly sure what to expect. I’d much rather sleep in on weekends than spend my morning digging through other peoples’ stained, mothball-scented junk. But who knows, maybe I’ll find something that makes up for my missing hours of sleep. The yard sale has already attracted a small crowd. 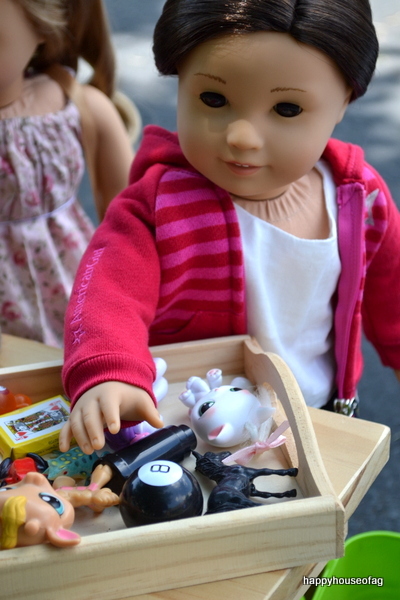 A young woman is rifling through the clothes while a child digs through a box of dolls. A middle aged lady in a bathrobe, probably the person in charge of the sale, sits in a chair and idly sips her coffee while staring at something in the distance. She looks like she’s still half asleep. 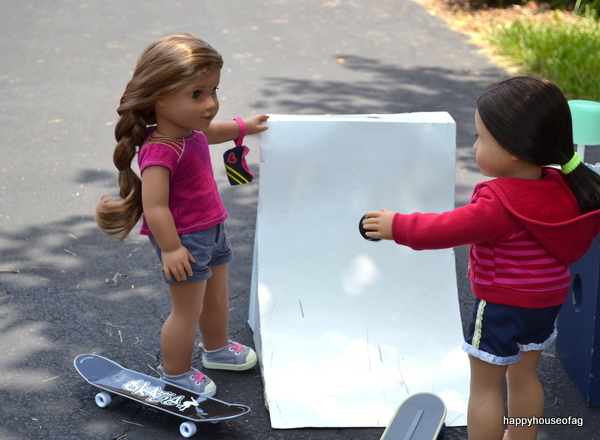 I bet Eve could pick up the skate ramp and carry it away without paying and the woman wouldn’t even blink. “There it is!” Eve exclaims, pointing at a scuffed ramp beside one of the tables. We hurry over to get a closer look. Nevaeh drifts off along the way to examine a handmade tea set. Eve rolls her eyes. “Nice try, Parker. I’ve never made a fool of myself. Ever.” She tucks her board under her arm and heads over to purchase the ramp from the bathrobe-clad woman. I join my other sister by the table. She’s moved on from the tea set and is now checking the price of a cactus in a terracotta pot. Piled precariously on the overflowing table is a rusty watering can, a dented bike helmet, and a box of wrinkled magazines, but what catches my eye is a tray of cheap toys. I prod at the little plastic figurines with my finger. In the back, half covered by a mini telescope, is a black orange-sized ball. I scoop it up; it’s smooth against my palm. I peer anxiously at the window in the ball as the octahedron rattles around inside. Despite not believing in it, Nevaeh is holding her breath, too. The ball settles on maybe. “I’m not si –” Her protest is cut off by a violent coughing fit. Something flutters around uncomfortably in my stomach. I almost stole something. Sure, it was an accident, and for a good cause, but it would’ve made me a criminal. 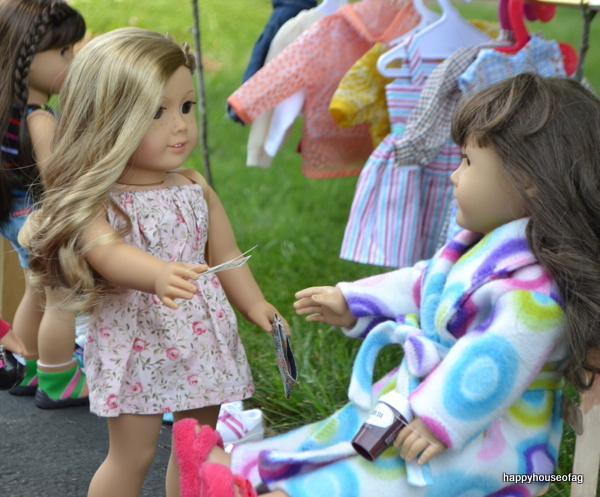 “I don’t have any money,” I whisper to Nevaeh as we slink over to the woman. “It’s OK,” she promises, and wheezes again. “I’ll pay for it. I have money from babysitting.” She fishes her floral wallet out of her purse and hands over two dollars. “Thank you, ma’am, have a nice day,” she mumbles to her feet. The woman grunts and takes a long sip from her coffee. I jog over to where Eve is admiring her new skateboard ramp. She’s running her fingers lovingly over the scratched surface of it. “Yeah, right,” Eve huffs, stepping onto her sticker-covered board. “I’ve been skating since I was twelve.” She makes to push off, but the second her sneaker leaves the ground, the skateboard shoots out from under her and she’s lying on her back, groaning. She touches her arm gingerly. Flecks of blood and asphalt stick to her fingers. “OK, so maybe it works,” she growls. Nevaeh is at Eve’s side a moment later. “What happened?” she gasps, helping Eve to her feet. 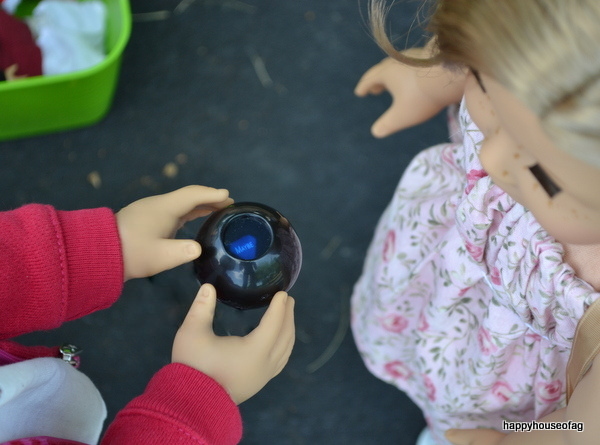 “The magic eight ball was right again,” I explain. We both turn to stare at Eve, who shrugs and starts texting. “I don’t care either way.” Her phone dings with an incoming message. “The guy who told me about this yard sale is going to help get the ramp home. We need to stay put for awhile until he gets here with his truck.” She plops down on her skateboard and keeps messing with her phone. Fifteen minutes later, Eve’s friend, a shaggy-haired, tattooed boy, shows up in a graffitied truck. Eve and I help him lift the ramp into the back. He says he has extra seats and offers to drive two of us home, so Nevaeh and Eve cram in beside him. Pop music blares from the radio as they drive off. 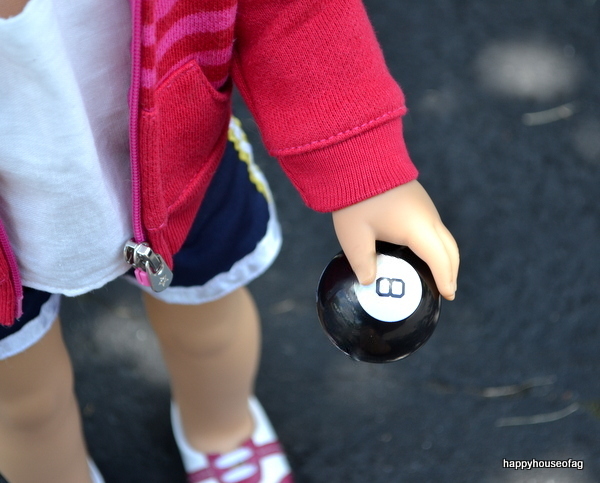 I walk home by myself, rolling the magic eight ball around in my hands. I love this kind of magic, but deep down, I secretly agree with Nevaeh. Her coughing fit and Eve’s fall were probably just coincidence. But part of me wonders if there’s more to it than that, if there’s something else going on. If it really is magic. I tilt my head back, letting the morning sunshine warm my face. There are clear blue skies as far as the eye can see. Off in the distance, there’s a roll of thunder. I shiver despite the heat. Wow, so good! Great photos Loren! thank you! that’s smart of you, the magic eight ball knows all things. This is so intriguing! How did you think of this? thanks! 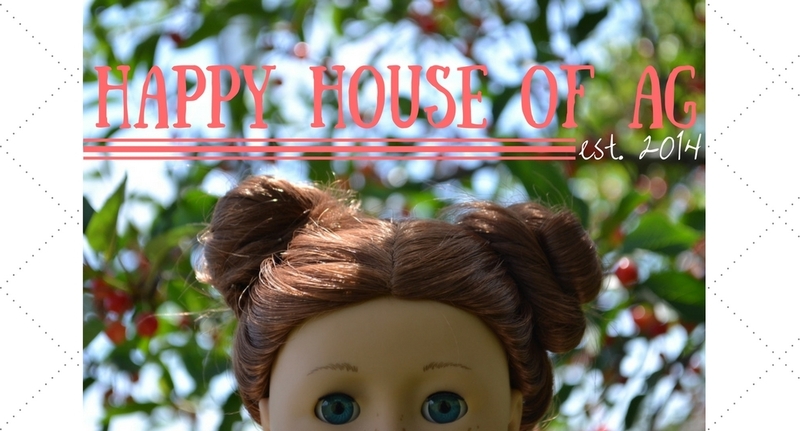 i get inspiration for my photostories from my life, and i got the idea for this because my family was planning a yard sale. using the magic eight ball as a plot device was my mom’s suggestion. i’m not sure when i’ll put up their profiles. i’m going to be really busy all summer so i might not get a chance soon. Oh, that’s a good idea of a way to think of them! Cool, I can’t wait to see them when they come up! Omw. This was great. Like, really really REALLY good timing (I’m sure you heard about Sam :'() Keep doing what you’re doing and I love the way you did Eve’s hair. Is it a braid that’s been pulled out a bit or what? i’ve been working at a summer camp the past few days so i actually don’t know about sam. is she ok? thank you! yeah, it’s just a loose braid. 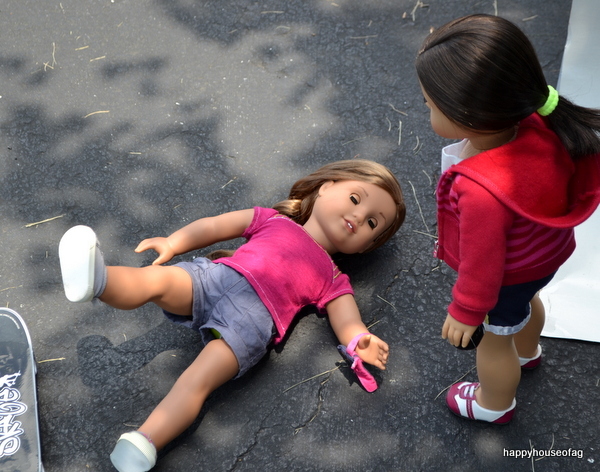 Sam quit her doll blog :( She said she didn’t feel like doing it anymore and it was…depressing. haha yeah, i don’t plan on leaving anytime soon! p.s. 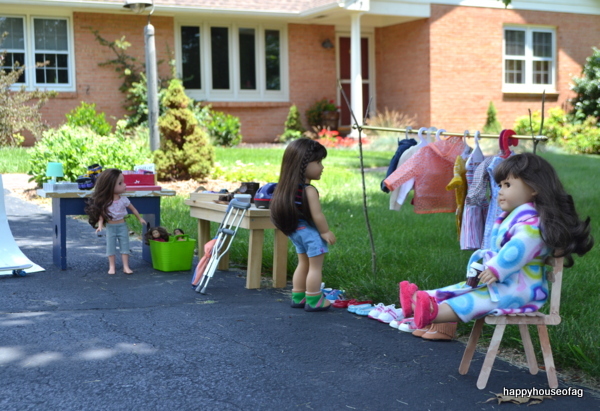 i actually like yard sales, but they would be so much better if they were an afternoon thing. thanks, rutvi! a car stopped in front of my driveway while i was setting it up and the driver just sat and stared for a minute, it was kind of weird. Hi! I’ve been following your blog for a while now, as an AG fan and fellow collector, and I love you photos! Your post the other day about the traits of an AG fan was spot-on. However, as a professional editor and writing coach, I wanted to say this story was great. The ending was so powerful, open-ended and ominous, and the pacing was a perfect mix of tense and light-hearted. You really have a gift with words. hi! it makes me so happy to hear that. That was my dream growing up, too. Now, I’m living it, helping authors with their stories and writing my own everyday…and getting paid to do it. It’s an amazing thing, and when it is something God has called you to do and put on your heart, it’s always worth pursuing. If you ever want a mentor in your writing, let me know. I love working with up-and-coming writers for free (as I know I certainly didn’t have enough money in my allowance to pay for a writing coach…but I’d have love to have had one when I was fourteen or so and really starting to follow my writing dream).